If you have any dietary restrictions, communicating them clearly can be an issue, especially when you don't speak the language. Here are a selection of print-and-cut sheets to bring along with you when you travel to Japan. Each U.S. letter or A4 sized sheet has 10 business card sized cards that state a particular dietary requirement. You may want to show this to your server at a restaurant, or your host (if s/he speaks Japanese) so that they can explain things. If you're invited to someone's house for dinner, or you will be a house guest, you may want to give or send the appropriate card to your hosts in advance. I've kept these cards as straightforward and simple as possible. If you have multiple allergies or eating restrictions, please combine the various cards as needed. Usage and distribution: All of the PDFs listed on this page are free to downland and print. Please keep the link at the bottom of the page. Do not re-distribute by uploading the files to another site and so on. If you find these useful and want to spread the word about them, please point back to this page. Please note that ultimately, the responsibility of avoiding foods that can adversely affect you belongs to you, the consumer. These cards do not transfer that responsibility to the restaurant or whoever is serving you, but just helps them to help you. See this page for tips on being a vegetarian or vegan in Japan. Since it's impossible for me to cover every single food ellergy that people have, here is a fill in the blank card. 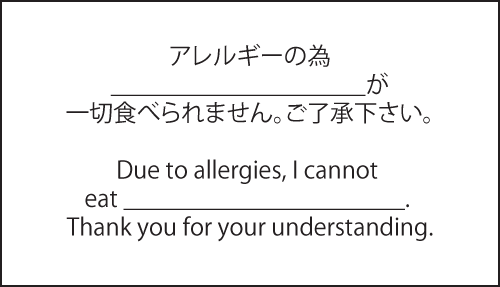 Just look up the name of the food you are allergic to in Japanese (Google Translate is handy for this) and write it in the blank. Using roma-ji (writing out the word using the alphabet) is fine - everyone in Japan can read roma-ji. Even writing in the English word for whatever food you need to avoid is ok too. Keep in mind that if you absolutely must avoid alcohol, even if cooked, then you may have a hard time eating out in Japan and need to avoid traditional cuisine (washoku), even if it's vegan (i.e. shojin ryouri or Buddhist cuisine). 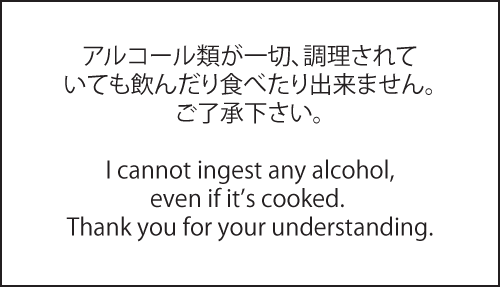 See why and how alcohol is used in Japanese cooking. Submitted by maki on 2012-05-28 18:31. Great idea. My father had to go to Japan for his work and he gets migraines from certain food triggers. I thought about trying to make him a sign but my Japanese is not good enough. I think he ended up eating on base anyway and not really trying any of the local food, which is a shame. This is a great tool. Thank you Maki. These are wonderful, Maki! I am extremely allergic to strawberries and must carry and Epi-pen with me, just in case. My husband and I travel internationally a lot, and I've had to learn to say "I am allergic to strawberry" in a few different languages. Japanese, however, is one I haven't tackled yet. I want to learn since we do plan to visit Japan someday! Brilliant! Exactly what I need this summer. Thank you so much! Japanese relations are all good and well, but I don't speak a word of the language. Could you make one for soy? (yes, soy is in everything there. I predict good food times for me). I am allergic to soy also. As an American living in Japan, with limited Japanese, I do not have many issues. You can eat Thai, Indian, Sushi, and lots of other foods. Just be careful of the soups. You will learn to recognize all the different versions of tofu and soy beans. Just wanted to comment that you don't need to be too afraid. You will enjoy eating here. How about one that says "I do not drink any alcohol"? I'd think that would be useful for a lot of people. Also, because of my religion, I don't drink alcohol, coffee, or tea, so one saying that would be nice, too. Hi Maki, as a moslem, I don't eat pork products and was wondering if there was a card saying that? I had the hotel concierge write, on the back of a business card, that I was a vegetarian. I have no idea what he wrote so who knows what I was trying to communicate. A few places understood. Many looked at us as though we were from the moon. My friend is full blooded Japanese but was born in Berkeley, CA and speaks minimal Japanese. I am caucasian English so we really confused people. For the most part girls/women servers just giggled and ran off to get someone else who also giggled but I guess was stuck with us. Didn't go hungry so all in all worked out for the best. 1st. a schoolgirl, 2nd. a young women, 3rd. any women. Last resort a guy. We had a young women get off her bike turn around walk us six blocks (r & l) drop us in front of where we wanted to be and then turned around and rode off, she didn't speak a word of English but smiled the whole time. We tried asking guys of all ages and were ignored. Face thing I guess. Except for a couple of gay shopkeepers, who were great. They didn't speak English but after having a friendly argument with each other, and us, walked us to the restaurant we were looking for. Fantastic people and beautiful country. Definitely one for the bucket list. Really glad to see you are hanging in there, nil desperandum and all that! This is really cool. You have Wheat allergy but having a Gluten allergy excludes wheat and other grains such as spelt. Seafood allergy is also a big one -shrimp, crab allergies etc are big ones. Very cool, its unfortunate I can't use any of these. My family would appreciate if there was one that specified we do not eat any seafood or shellfish, only meat or poultry. This is a great idea! The wheat one is tricky though because a lot of sauces (including soy sauce) are made with wheat. So, someone with a wheat allergy or celiac disease would need to stray away from a more substantial list of "wheat" type ingredients. Wonderful idea though for vegan, dairy, etc!! been looking into going to Japan and was worried about communicating my dietary needs! I'm a pescatarian, but this is due to having an allergy (or more a very strong intolerance) to chicken, with other meat related allergy's running in the family (so I don't like taking risks). This will really take some of the stress off when I finally get to go! Thanks loads for these cards, I was just looking up how to say "I am a vegetarian" the other day! 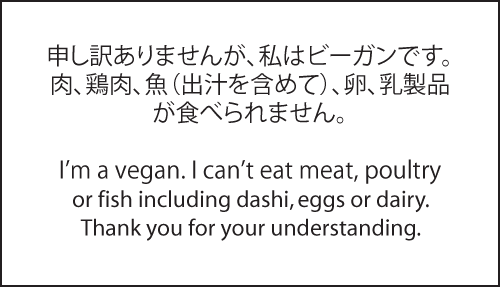 Regarding your comment about relaxing your restrictions to allow yourself to have dashi - how about a card that says I'm vegetarian and can't eat meat, poultry and fish, but omitting the dashio bit? Thanks. Can you make one for eggs? As odd as it might seems to some, I am having a really hard time avoiding eggs here. My soy allergy is not posing a problem, but I'm nursing my son who is allergic to eggs and dairy. Thank you, thank you for making these!!! THANK YOU for these! 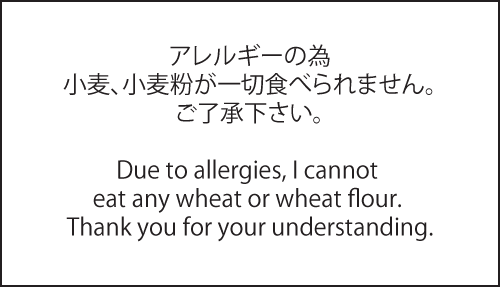 I am gluten intolerant and was going to go visit friends in Japan, and was worried that I'd be sick most of the time due to wheat being sneakily in food (my Japanese is rusty at best!). This is really a sweet and giving thing you have done. There are many of us who stay away from many ethnic ideas because of allergies. One for me is MSG and I just had a rather nasty bout with raw onions. Not all Dashi is made from fish, a lot is seaweed (or mushrooms) only. 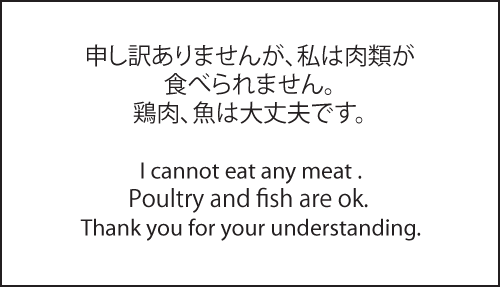 Making this distinction makes a huge amount of difference to eating vegetarian in Japan, and is really hard to to explain - can you get this onto the cards? In my admittedly limited experience of travelling with vegetarians in Japan, it is something I thought was influenced by face saving - a direct question is tantamount to saying "is your Dashi made with cheap ingredients", to which the initial answer is usually "it's fish Dashi". I also had at least one conversation that suggested the percentage of veggie Dashi was rising, principally around cost, but I have no way of verifying this. I think you are entirely right in saying it is the "norm", which is why it is an important clarification, for places where you can eat safely! 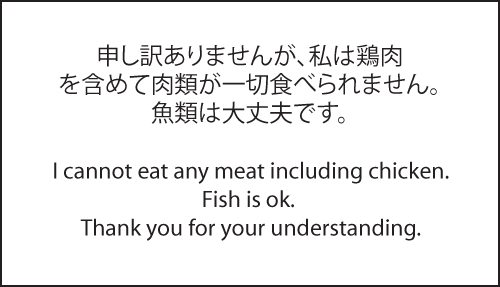 Hence the suggestion to clarify the "fish (including Dashi)" to "fish (including Dashi made from fish eg Katsuboshi/Niboshi)". By making part of the overall request, there is no face involved, so you are more likely to get an accurate answer too. And, since I didn't say before - these cards are great, the best execution of this sort of thing I have seen. Thank you! These are awesome! I don't have allergies or food restrictions. But I know so many people who do! Thank you! Is there one for only being unable to *drink* alcohol (飲めません), but okay with it as an ingredient? I can handle some amount of alcohol (such as whatever kind it is that inari pouches are drenched in), but I can't handle straight-up alcoholic drinks (I'm of drinking age by Japanese standards, and within a few months by American standards, but straight-up drinks make me sick). Also, does that allergy template work for anything? Like mushrooms (きのこ)? It's not life-threatening, it's about the same "get out of the way in case I throw up" as the straight-up alcoholic drink thing, but I still try to avoid them if at all possible (and the first time I had shabu-shabu, I did have to ask to remove the shrooms from my vegetable plate). A vegan friend of mine lived in Japan for a few years. Another friend of mine, who is Japanese, couldn't believe he survived Japan as a vegan. Luckily, the vegan dude was fluent in Japanese so he knew what to say and what to look for. Unfortunately, when he went to Korea, not familiar with the language, he just ate rice to be safe. I'm lacto-ovo and I always worry about what to eat when traveling. If I ever make it to Japan, I'll be sure to have this card with me! These are fantastic! I'm going to pass the word along to the American community here in Okinawa, as many of my friends have dietary issues. As a Japanese speaker I try to do my best to help when we're eating out, but occasionally I come up against a cultural norm I didn't expect (ie I told the server my friend didn't eat meat so they served her pork, which here in Okinawa they didn't see as "meat"). Again, these cards are an excellent idea - thank you!! jisho.org is a good online Japanese dictionary. It has a lot of slang, colloquial terms, plus science-y/medical stuff so it might be more accurate than Google translate. This is so kind. Thank you! How about one for not being about to consume anything that comes from a pig including gelatin. When I went to Japan I had a hard time with this. Thanks! Thank you Maki! I work in music and travel to Japan at least once a year...and know many American and UK based musicians who travel frequently too. Come Fuji Rock, I will be passing these around! You are the best! Now looking back, I really wish I had these cards with me. While I wrote my host father a letter explaining my dietary restriction (vegetarian), I had made a mistake by saying "I don't eat meat," which, little did I know, only includes 肉 and not 魚. So much misunderstandings ensued. I basically gave up lacto-ovo to make ordering easier. I didn't mind though. Japanese food is delicious the way it is; just like Thai food, it's never complete without fish (sauce). What a great idea to come up with these printable cards in Japanese! I better come up with the similar dietary restriction card in Korean as well. Just like in Japan. May foreigners in Korea are having hard time communicating with people, especially with information on the food.Thanks for the inspirations! I love this! Will be sharing with my friends living in Japan. because as a Muslim, I've been having a hard time making sure for my family there were no pork products in our food in Japan. What a brilliant idea! My husband is allergic to wheat, peanuts and raspberries - we're planning to go to Japan next year - these will be invaluable! Thank you so much! Thank you so much for taking the time to make these cards! I am deathly allergic to dairy products, and I'm always so worried that I won't be able to explain myself sufficiently, or politely to restaurant staff. This is a great load off my mind. I do, however, have a question. 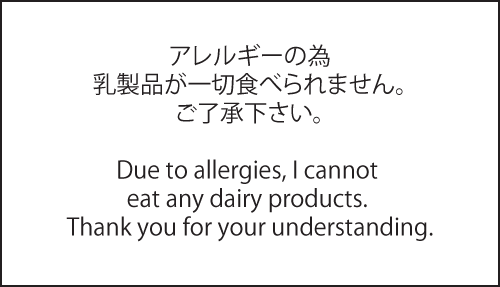 On the dairy allergy card (which I am printing SO MANY OF) it has (lactose intolerance) in parentheses. A lot of times people confuse the one with the other (they aren't mutually exclusive of course, but LI is just a symptom of the other) and I'm wondering if the language is very emphatic in Japanese? People assume that lactose intolerance will mean a night of discomfort, but I'll go in to anaphylactic shock. Thank you again for going to such trouble. These are great! We live in northern Japan and I can't have gluten. Unfortunately, most soy sauce has wheat and therefore gluten. 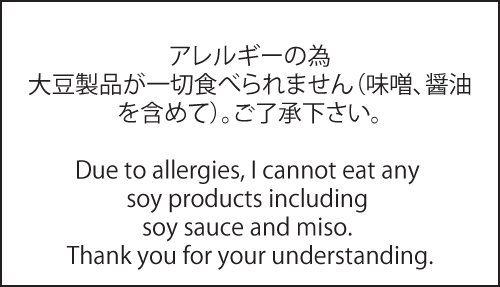 Do you by chance have a card that includes soy sauce on the wheat allergy card? 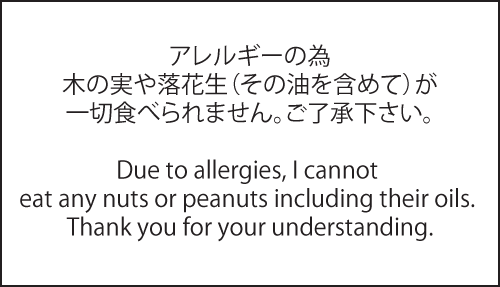 We are going to Tokyo next week and I'm worried about getting sick but I don't know enough of the language yet to include the soy sauce part of the message. Wow these are such a great idea! The first time I was in Japan, I wish I had had these! Since then, I have learned to speak pretty decently and the last time I summered in Kyoto had amusing conversations in Japanese that are just as funny in English. me: "Do you have any of these without meat? I'm a vegetarian"
"No meat? This bacon one is good"
me: "Oh, I don't eat bacon---no meat"
"Bacon isn't meat, it's pork"
me: "No meat, like, no animals"
"Animals? It's pork! That's vegetarian!" friend: "So you don't eat meat? Or fish even?" friend: "Is it because you're allergic? Or sick?" me: "no, it's a choice"
friend: "Are you mentally ill?" I love your blog, hope you're feeling well! You might wish to consider changing the lacto-ovo one slightly to make clear that fish eggs are not OK. I'm a lacto-ovo vegetarian and live in Japan, and one thing I experience time and again is that if you say eggs are OK, Japanese will include fish eggs in that. For anyone reading this who's thinking "Why would birds' eggs be OK but fish eggs not?" (like the Japanese mostly seem to think) - you have to kill the fish to get its eggs. You don't have to kill a chicken, quail etc. to get its eggs. Thanks, and great job so far! Thank you for this! It will be useful - I'm travelling to Japan with a vegetarian next month! Just so you know, the very first letter size PDF link (for no meat) is linked to the wheat allergy PDF instead - you might want to correct this. Ah, I thought it might be important to mention this, but I see Kari already has. With gluten intolerance (being unable to eat anything with wheat), even consuming standard soy sauce or anything with MSG could be problematic. That would be so hard to avoid. My brother has celiac disease/gluten intolerance, and my doctor found out through blood tests that I have gluten sensitivity. I'd really like to try avoiding foods with gluten, to see if I feel healthier, but... soy sauce?! They do make gluten-free soy sauces, but I don't think you can find them just anywhere. This is great! 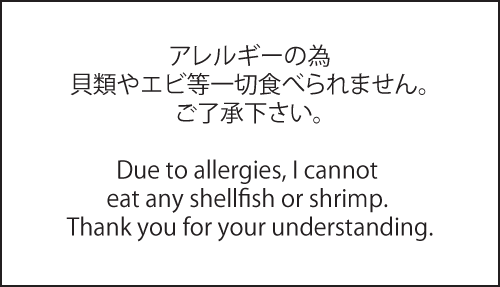 I don't have dietary restrictions myself, but two people I work with here in Japan have allergies, to shellfish and citrus. I've sent them the link. I love your site as always, I visit it or especially flip through my very worn copy of Just Bento almost daily. I hope you're feeling better these days. I <3 you so much Maki!!!!! Maybe everyone who wants a special card defining their own sensitivities could, I dunno, follow the instructions and use Google translator and MAKE THEIR OWN?! People need to learn to read and research when they are looking for something. How are these people going to travel to a place where they do not speak or read the language, just stand in the streets and whine until someone comes along and fixes their problem? 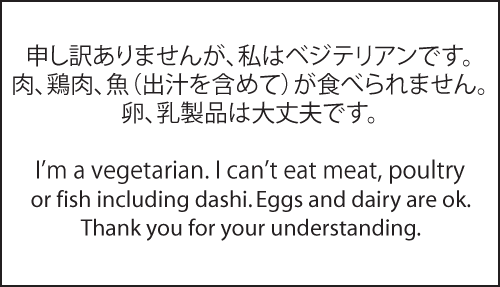 Would this be how you say, you are a vegetarian and cannot eat meat, poultry or fish, but dashi, eggs and dairy are ok....? Hi, what part is the dashi part of the phrase- I'm willing to compromise on that- so I can scratch it out? Thanks, this is such a good idea! Dashi is 出汁　(or in hiragana, だし). My fiancée has an unusual allergy. Chocolate allergies run more or less in his family and he cannot eat any cocoa products or byproducts. Although this won't be an issue with most foods I wanted to know how to express this for snacks or desserts. Would you be able to write me a phrase to say that I am a Buddhist / oriental vegetarian? I do not eat meat, chicken or seafood, but eggs and dairy are okay. I also avoid onion and garlic.